From cafes to fine dining, the term "Sous Vide" has been widely used to introduce a kind of cooking technique that allows the ingredients to retain moisture by either placing the food item in a water bath or steam environment. It was always deemed as a complicated cooking process that only restaurants or very serious home cooks use. For the most parts, it is beyond the imagination of us newbie home-cooks who don’t necessarily have 7 hours to spend in the kitchen to whip up an epic meal. Basically I’m talking about myself here - One who cooks sporadically because I have a very serious chef at home aka my grandmother. Also, hectic work hours does not necessarily provide me with the luxury of time to experiment in my own space. Having said that, the Anova website constantly has promotions, so do keep a lookout in order to snag one at a good deal - like right now. So click on the image if you'd like to check it out. But read on for more details on how I use it. Look at that sleek portable machine! This is completely different from the industrial water bath that I've always associated Sous Vide with. Anyway, I ordered it online and it took only three days to arrive. Of course, my boyfriend was very pleased with his birthday surprise that came 2 weeks early. 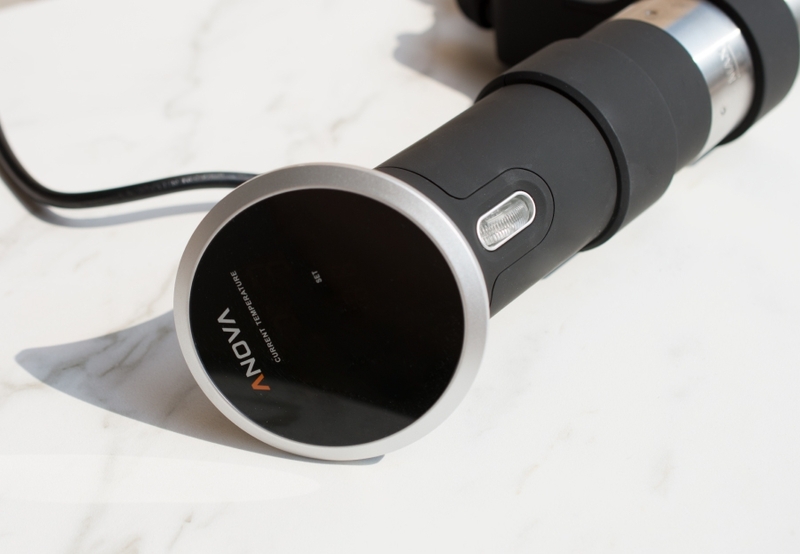 I ordered on a Thursday evening and it came on Saturday evening, so clearly if you have a last minute inspiration to cook a meal that requires sous vide, Anova’s quick delivery will be here to save the day. Ok enough about the efficiency of the company and more on the product. The Anova Sous Vide Precision Cooker is exactly like it’s advertised,- fuss free and easy to use for any kitchen novice. The adjustable clamps make it easy to secure it to any kind of pot (metal, glass or plastics) so you can make use with what you have and not worry about having a suitable pot. Making poached eggs, or even that perfect hard boiled eggs, is one of the simplest things to do. Yet, for many, including myself, it is also the most difficult. Even an experienced chef may get it wrong at times due to external elements such as egg size and temperature. However with sous vide cooking, it will always be cooked to perfection. Using the Anova App, which is specially designed to connect with your device, you simply choose the style of eggs you want to cook and the preset temperature will be set to your cooker. The water will pre-heat to the ideal temperature needed to cook your eggs and the cooker will prompt you when ready. All you need to do then is to drop your eggs in and then wait for the magic to happen! I especially like using the sous vide for tricky meats that tend to dry out when overcooked, such as pork chops and chicken breast. Cooking it sous vide style gives ample moisture to the meat retaining all the flavourful juices. It also cuts down your marination time as you can throw in all the herbs and spices you wish to use with the meat into the air tight bag and it seals everything together beautifully. For those who hate the texture of dry chicken breast, this is the best and easiest way to get the meat tender and juicy. For meats, you can choose exactly the kind of cuts you are cooking and the type of textures you want to achieve, for example you can choose between a rare or medium rare porterhouse steak for beef and tender and juicy for pork chops or even firm and slightly dry depending on taste and type of dish you are cooking. There’s no more second guessing on whether your meat dishes are being cooked to the texture you want them to be by constantly checking in on them. I didn’t even need to attend to the cooker! The best part about purchasing the WiFi-enabled version is that you can even remotely control it from anywhere. So, I can leave the house to run other errands (like picking up things I forgot I needed for my dish, which ALWAYS happens) while monitoring my meats from afar. So what happens after your food is cooked? No, your poached eggs do not magically become eggs benedict. This is where the app comes in very handy. Basically, it guides you to though the finishing steps of what is needed to be done to achieve your dish you’ve started out to create.You can implement your own recipe and follow the steps loosely but it’s really the "Idiot’s Guide To Cooking", which is so helpful. For a dinner party that we had a month ago, I wanted to make pork chops and bought lovely Iberico pork collars for this experiment and they turned out to be the best pork chops I’ve ever made! The finishing steps guide you on how to achieve the optimum results for the type of food you’ve picked and is a a fail proof guide/recipe. My pork chops were perfectly glazed on the outside and moist and juicy on the inside. Needless to say, all our friends at the dinner became our "guinea pigs", and they were very pleased. Everyone immediately self-invited themselves for the next round of dinner party at our house - not bad for a novice chef huh? Now, I don’t claim to be a fantastic cook but I do love and know my food with a passion. 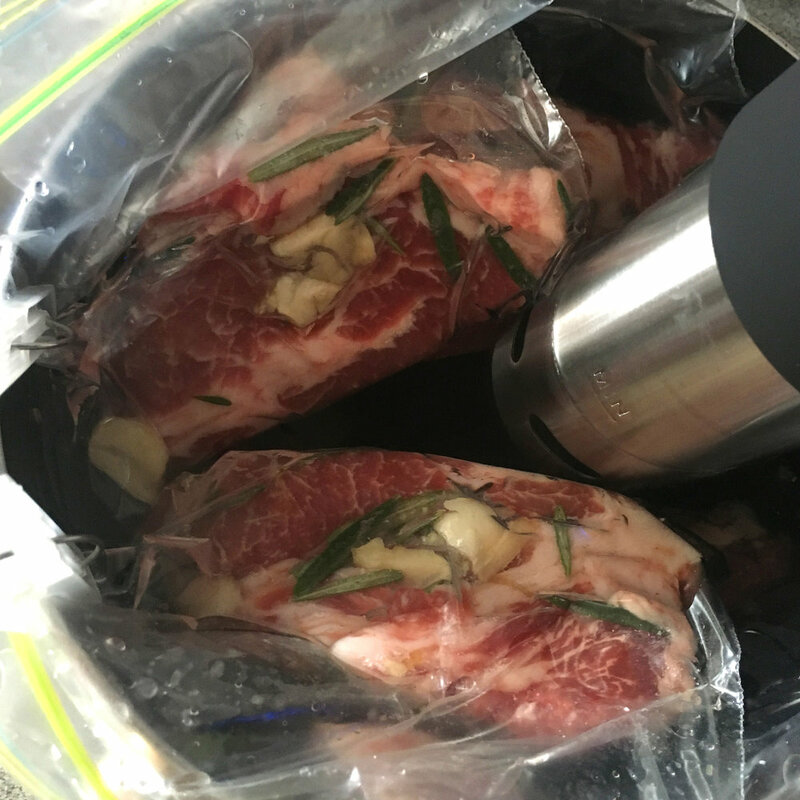 What I love most about the Anova Sous Vide Precision cooker is that it makes a form of cooking accessible to everyone. It’s not intimidating at all and you don’t have to be a professional chef or a perfect Instagram-worthy cook to use it. It helps you step by step to achieve the best results in your cooking and is a great fit for anyone who has a hectic lifestyle and wants to cook a fuss free but delicious meal. I highly recommend the wifi enabled one to everyone because it allows you to control your cooking remotely. Imagine that! Monitoring your pulled pork dish from the office while answering to emails, this is why I love technology and the wonderful inventions that come from its good use.